A truly beautiful way to celebrate that special person in your life who has reached a significant milestone age. 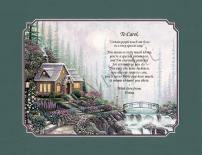 It can be personalized to reflect your family's names and heartfelt sentiments. Truly a special birthday gift for someone special in your life. 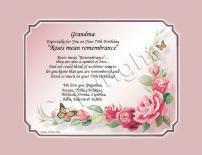 Add your own personalization to reflect your heartfelt sentiments. They will cherish it always! 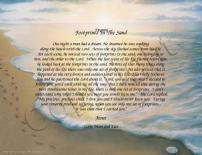 This is a gift that expresses your thoughts about a special person as you wish them happy birthday. 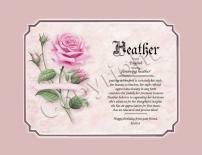 It can be personalized with their name and with your personal sentiments. This well known and inspirational poem is a beautiful way to wish someone happy birthday and, at the same time, encourage them in their life. A wonderful and unique way to remember someone on their birthday. 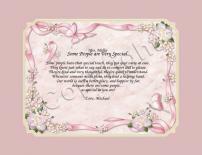 A thoughtful, personalized gift that lets them know they're special! A fun and special way to wish someone a very happy birthday. 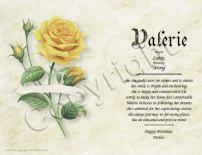 Add your own personalization to reflect your sentiments and Happy Birthday wishes!